I can't believe the week is halfway over already! Don't worry, we still have some really fun things planned for the days ahead! Today we read two more Dr. Seuss classics - And to Think That I Saw it on Mulberry Street and One Fish Two Fish Red Fish Blue Fish. We started with Mulberry Street. After reading the book the kids made up their own stories about what THEY may have seen. Pinky really enjoyed this activity. 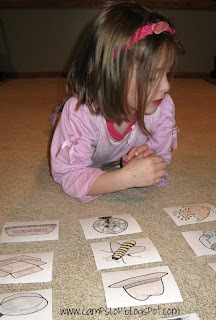 Here is her picture and story (the printable is from Chalk Talk: A Kindergarten Blog). 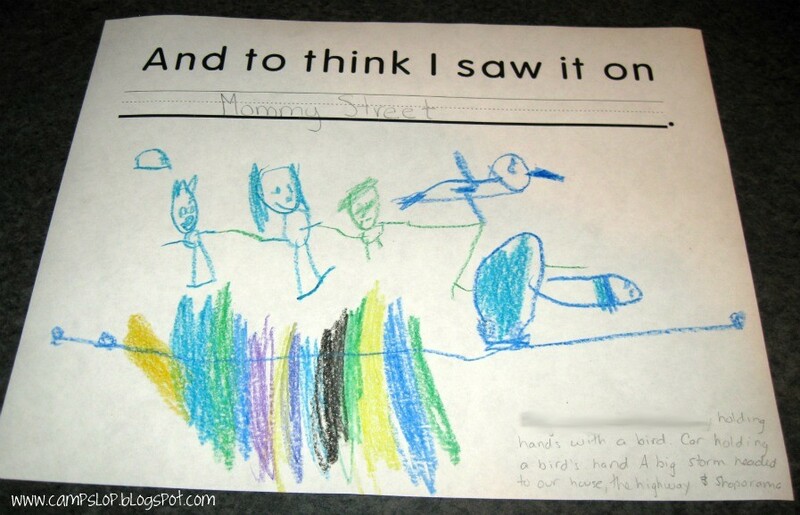 "Sprout, Chaos, and Mommy holding hands with a bird. The bird is holding hands with the car. A big storm is headed to our house, the highway and Shop-O-Rama." 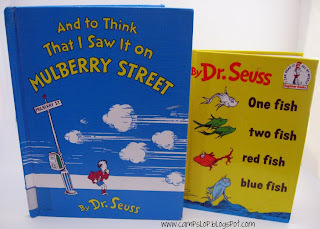 Next we read One Fish Two Fish Red Fish Blue Fish (I think my tongue needs to be in a splint for the next week to recover from all that tongue twisting rhyming!). We read the story at snack time, so naturally we had to have Rainbow Goldfish to eat! I gave the kids a few math sheets to "play with their food" and they were so excited (since I'm usually telling them to STOP playing with their food). Pinky loved the fishbowl addition sheet (also from Chalk Talk). Chaos loved the graph from What the Teacher Wants Dr. Seuss Unit. I colored the words at the bottom of the graph so he could tell at a glance where the fish went. He loved sorting by color. After snack, I gave Pinky and Chaos each a felt board I made (SO simple using just a sheet of felt glued to cardboard). 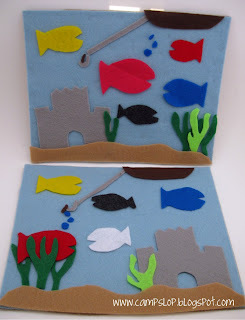 I cut out lots of fish and underwater items for the boards. These were such a BIG hit that I may make a few more with different themes too. Finally, we played a rhyming game before bed. (I'm so sorry, but I can't remember where I found these printables - if anyone knows, please email or comment so I can give credit). We started with all of the cards face up and picked pairs that rhymed. After a few rounds, Pinky decided to turn them over and play a memory style rhyme/match game to make it a bit harder. 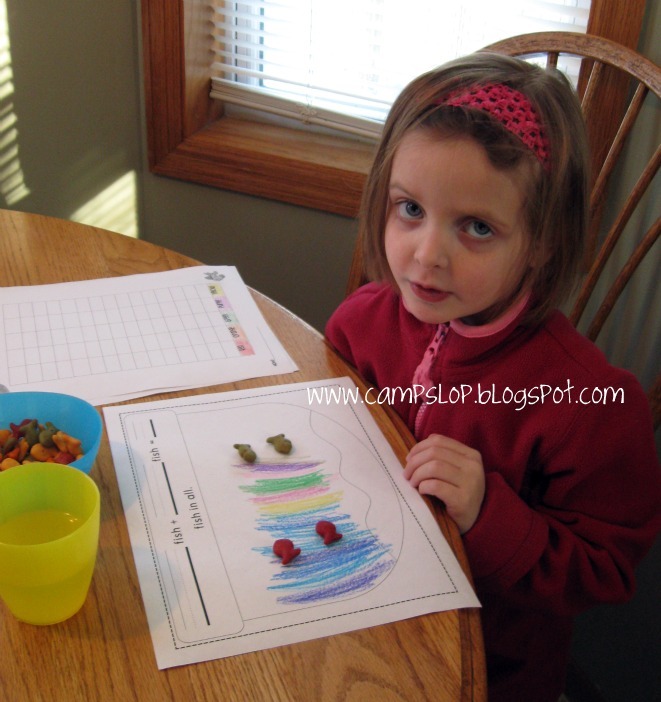 Be sure to check in tomorrow for an activity that I've been looking forward to all week! If you missed any of the posts this week, just click on the button below to get caught up! 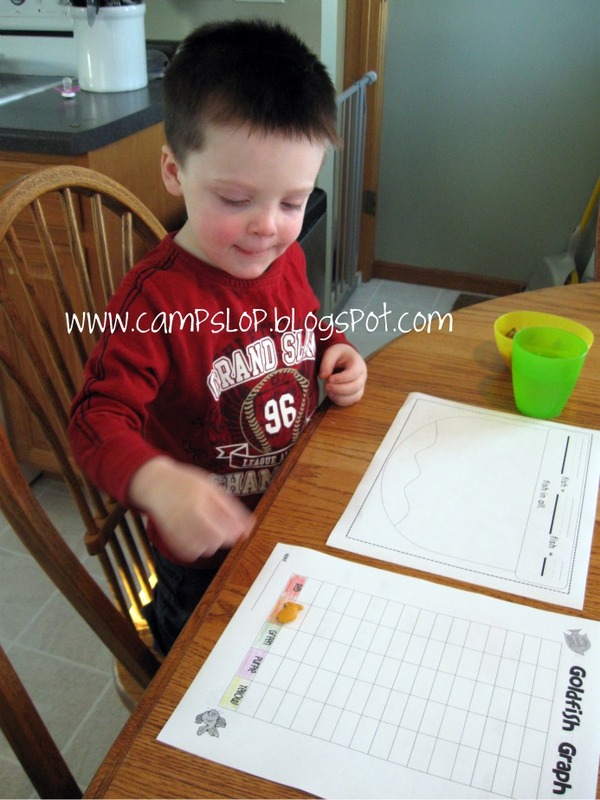 You have been doing some really awesome activities with your kids! Love the ooobleck! I agree about reading the Red Fish book---it gets really tiring!